Supper is over and we have had evening devotions. All the children have gone their own way now—some to bed and some reading, writing or just relaxing. I love evenings like this, when everyone is close by. Every mother has those moments, I’m sure. Making my day even more complete was having daughters Elizabeth and Susan and their sweet little daughters, Abigail and Jennifer, home for the day. This grandma actually fell asleep holding the baby on the recliner. Jennifer loves being held and cuddled. Elizabeth hasn’t started potty-training Abigail, but today I started asking Abigail if she has to go to potty. She even comes up to me and tells me she needs to go potty. Well, we go through the whole routine and then she just sits there. I told Elizabeth she will eventually get the hang of it. I don’t think Elizabeth is too enthused to start the potty-training process. I keep asking myself why I’m so happy to help potty-train my granddaughter when I dreaded it with my own children! Maybe it’s because I can do it for a few hours and then quit when they go home. My dad always told us if he had known that grandchildren were so much fun he would have had them first. It was just one of his many jokes. Back to supper tonight: our menu was biscuits, sausage gravy, eggs, potatoes and cheese. Son Benjamin and nephew Henry went after a new bearing for the buggy wheel on our one buggy. Then nephews Benjamin and Steven and niece Emma came over with some pon hoss and fresh sausage. They butchered pork on Saturday. The Eichers were happy to can and freeze food staples such as this beef, which is customary among most Amish families. 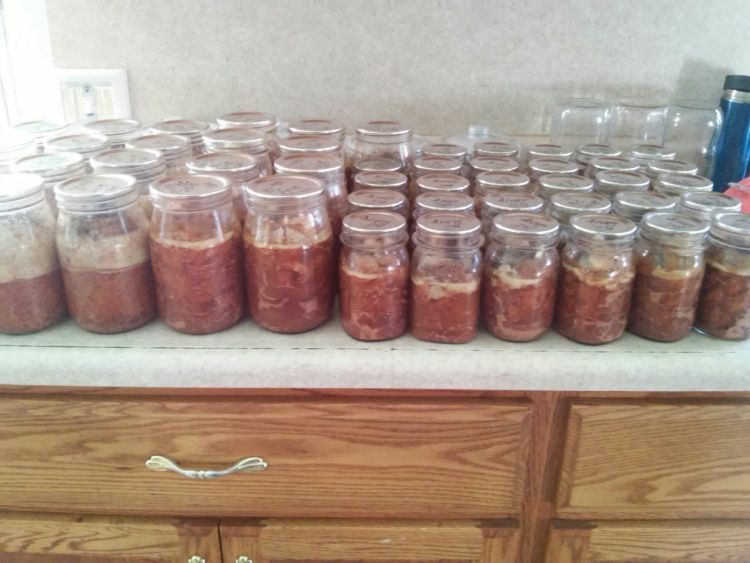 Our beef is all canned, bagged and frozen. Freezers are filled to capacity. Do we appreciate that we have plenty to eat? There are so many in this world who are less fortunate. Let us pray for those less fortunate and also pray for peace in the world. There is so much hatred. God can be our only comfort at times when all else seems to go wrong. My husband Joe and several of the children made around 300 hamburger patties, which are all frozen individually so they can be taken apart and put right on the grill. The rest of the hamburger was bagged and canned. I like using the canned hamburger for casseroles when I’m in a hurry. I went shopping with daughters Elizabeth, Susan and Loretta on Saturday. I felt so happy coming home to find out that this big job was all done—and maybe slightly guilty for not helping! On Sunday church services were held with Dustin’s (Loretta’s special friend) parents being hosts. Loretta, Lovina, Benjamin, Joseph and Henry attended church in their district. Joe and I were also planning to go but Joe wasn’t feeling well during the night so we changed our plans. Joe was also home from work one day, running a fever and just not feeling well at all. The next day he felt good enough to go back to work, but he was still ready to see the weekend come. Those early mornings come around so fast! So often we take our good health for granted. Several of our children and I went to visit sister-in-law Nancy one day this week. So much sadness. I have such a hard time going there and not seeing my brother Amos come walking to greet us. He was always so overjoyed to see us when we’d stop in for a visit. Amos and Nancy’s daughters—Lovina and her daughter and Elizabeth and her son—were home for the day. And Lisa, Laura and Sam were home, so we visited with everyone. We were happy to hear we have another nephew, Seth Paul, born to Joe’s sister Loretta and Henry on March 2. Seth makes child number eleven for them. Their oldest son, Henry, has lived with us for almost seven months now. He went home to greet his newest little brother on Friday night. That makes 59 grandchildren for Joe’s late parents. Joe’s mother died at age 54 when we only had Elizabeth. She would be so happy to see all her grandchildren now. Daughter Verena seems to be doing okay with her cast on her leg. She is getting a little impatient and tries to busy herself writing letters to others who need cheering up. A reader shared with me her recipe for hot wilted lettuce. She says they eat this on top of boiled potatoes. Fry bacon in large skillet. Remove bacon. Stir flour into grease and brown. Put egg in medium bowl and beat a little. Add salt, sugar, vinegar and water and then add this mixture to skillet. Add lettuce (you can use more or less than a head, as desired) and crumbled-up bacon and stir briefly in skillet until lettuce wilts slightly. Serve immediately. This is Verena, age 19. My mother asked me to write the column this week. Recently my life has been so busy with working Mondays, Wednesdays, and Fridays at the daycare. I also babysit for my friend’s three little boys whenever they need a sitter. I love children, so it makes me happy that my job includes taking care of many sweet little angels! With most of the children at the daycare being age five and under, it takes lots and lots of patience. The children are at such a tender, young, innocent age. I feel blessed to be able to care for them. I recently took a trip to Rhode Island with a lady I work for at the daycare center. We traveled with a group. Our trip started on April 2. We left Michigan before daylight, traveling through Indiana, Ohio, and on into Pennsylvania. We stayed the first night in Pittsburgh. We had such beautiful scenery from our eleventh-floor hotel room. The hotel was twenty stories high. Verena loved creating a special crayon wrapper for baby Abigail at the Crayola factory in Easton, Pa.
On Monday, we traveled to Easton, Pa., and toured the Crayola factory. We were able to play a few games and work with art. 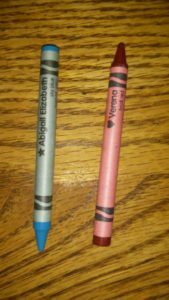 I was able to make two crayons of my own and could name the color on the crayon. 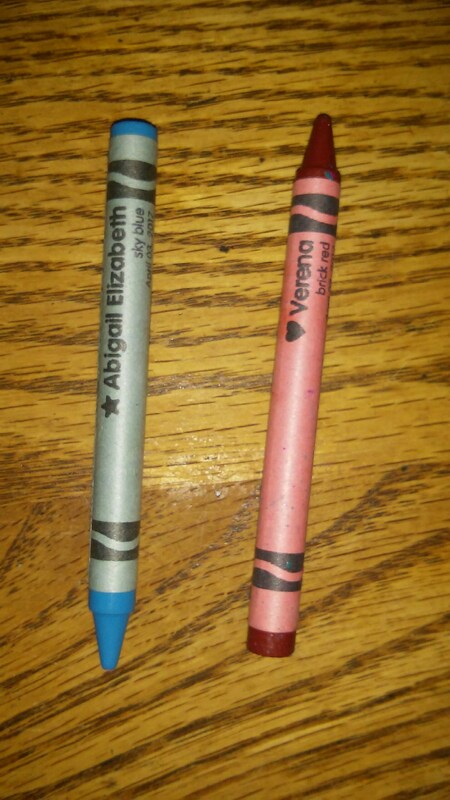 I chose the names Abigail Elizabeth and Verena for my colors. That evening we slept in New York City. The lights after dark are absolutely amazing. There is such a big difference between the lifestyles in a big city and the lifestyle I know as an Amish country girl! On Tuesday, we left New York City around 6:00 a.m. and drove to Newport, R.I. By the time we reached Rhode Island we had traveled through nine states. We drove along the Atlantic Ocean and then crossed the bridge to Rhode Island. The scenery was such perfect artwork created by our wonderful God. The ocean is always amazing to see and makes us feel so small. We stayed in Rhode Island two nights (Tuesday and Wednesday) in a nice hotel. We enjoyed swimming and relaxing in the hot tub. A few from our group took a three-mile walk along the ocean. I walked along the beach and saw seashells scattered about. While in Rhode Island we went to the Audrain Auto Museum. It was quite something to see. We then drove to Shawnee on Delaware, in Pennsylvania. Shawnee on Delaware is an unincorporated community on the Delaware River, a part of Smithfield Township in Monroe County. We stayed in a cabin in the woods at the Shawnee Village Resort. It was a very nice place to stay. Saturday, April 9, we started out and were going to stay the night in Ashland, Ohio, but decided to drive all the way home instead. I was so glad to reach home that night yet. I missed my family so much. It is nice to go on a vacation, but there is nothing like home and family. I was thankful that we had safe travels and a safe driver. I will forever remember this trip. On Sunday I stayed home and rested all day while the rest of the family went to church. Later in the day our family—sister Elizabeth, Timothy and Abigail, Mose and Susan, Dustin, and aunts Verena and Susan—all went to Uncle Jacob and Aunt Emma’s for supper and an egg hunt. I was happy to see my little niece Abigail again. It was a great night with family. Like usual, we all enjoyed looking for the eggs. Supper was campfire stew, fresh grilled ham, cheese, crackers, cherry delight, Swiss roll bars, fruit dip, apples and grapes. I’m getting excited for Saturday. I will be getting my Teacup Yorkshire Terrier puppy, Ricky. I have his bed and everything set up for him. I hope you enjoyed reading about my adventure. God bless! I will share the recipe for skillet casserole. I made if for our supper tonight. I don’t add the carrots and I wait to add the cheese until the potatoes are soft. It’s a very good casserole! Spread the ground beef on the bottom of a large skillet. Place potatoes on top of meat and then add a layer of onions. Pour the soup over top, and add slices of cheese over the whole casserole. Cover skillet and simmer for 40 minutes. Optional: diced carrots can also be added as a layer on top of the potatoes. Lovina Eicher is an Old Order Amish writer, cook, wife and mother of eight. She is the co-author of three cookbooks; her new cookbook, The Essential Amish Kitchen, will be published in 2017, available from 800-245-7894. Readers can write to Eicher at PO Box 1689, South Holland, IL 60473 (please include a self-addressed stamped envelope for a reply) or at LovinasAmishKitchen@MennoMedia.org. If my dad were still living, he would turn 85 years old today. But God had other plans, and Dad passed away in May 2000, at the age of 69. Every year on his birthday we still remember what day it is. My dad left me a legacy of wonderful memories and of precious love. My dad was quiet in a group, but if you knew him, you would find him cracking a few jokes and find he had a sense of humor. Dad grew up in a family of 13 children. He was the third oldest. There were three girls and ten boys. Dad found out early in life how to work, and it stayed with him all his life. He was an early riser and never liked going to bed late. If he did have free time, he loved taking care of his purple martin birdhouses or reading. I inherited my love of reading from him. If he found a good book, he would always ask me if I wanted to read the book. Dad loved to read educational books and learn new things. Dad passed away about five weeks before we had Loretta. Benjamin, 16, doesn’t remember him but the older girls remember him for teasing them a lot. I’ll never forget when our first son, Benjamin, was born. I had him at home, with Joe’s aunt Sylvia being my midwife. Mom was also there, and after Benjamin was born, Dad and my sister Verena brought our daughters Elizabeth, Susan, and Verena back home to meet their new little brother. At first they didn’t want to look at the baby, and we couldn’t figure out why. Finally they said, “Well, Grandpa said that we have a brother now and that he will be able to handle all three of us.” They couldn’t figure out how that could be when they saw little 4-pound, 13-ounce Benjamin! We had a good laugh about it. Benjamin is not so “little” anymore, and is taller than all his sisters. My uncle Emanuel’s birthday is also today. He is a year older than dad. If you get to read this, Uncle Emanuel, I wish you a happy 86th birthday! May God bless you and Aunt Leah with good health! I had the privilege of visiting with Emanuel and Leah in Marysville at Uncle Benji’s viewing. Their daughter, cousin Emma, lives in Salem, Indiana, and was also at the viewing. I hadn’t seen Emma in years. After we looked more than once, we recognized each other. My thoughts are with Emma, as she has been a widow for almost nine years. A few years before she lost her husband, their almost 15-year-old son was killed. Emma has twelve children living yet, with all but a few married, if I am correct. Yesterday the girls and I attended sister Emma’s Tupperware party. She served a delicious lunch to everybody afterwards. We picked up daughter Elizabeth to go with us to the party. Then in the evening Timothy and Elizabeth came here for supper. Timothy is on crutches and will probably be off work for several weeks yet. A week ago he was cutting a piece of log with a chainsaw when it somehow slipped and went through his shoe, cutting right into his foot. He goes to get it checked out every few days. Elizabeth changes the bandages every six hours around the clock. It’s been very hard for him to sit quietly, especially knowing there isn’t any income coming in and the payments are still due every month. I told them God will provide if they keep their trust in him, although I do understand their concern. Accidents like that can happen so fast. Hopefully it will heal quickly and without too much nerve damage in his foot. We wish God’s blessings and good health to everyone. This week I’ll share the recipe for pepper steak potatoes. A good winter evening meal! Cook potatoes in water until tender. Sauté beef and garlic in oil until meat is no longer pink. Remove and keep warm. Drain drippings. In the same skillet, sauté pepper and onion. Return beef to pan and add potatoes and pepper. In a small saucepan, combine cornstarch and broth until smooth. Bring to a boil and cook until thickened. Drizzle over meat mixture and toss.